A power shift is underway in Venezuela, where citizens could be forced to work on farms. 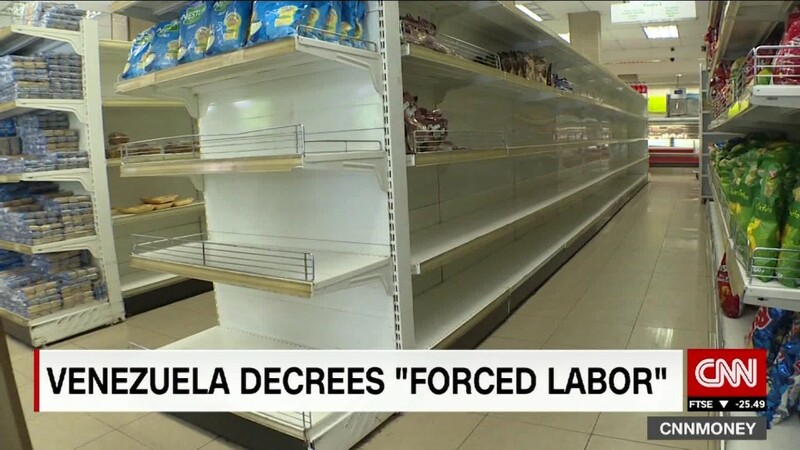 Amidst massive food shortages and an extended state of emergency, Venezuela's government issued a decree in late July that would force people to work in fields up to 60 days and possibly longer. Humanitarian groups are blowing the whistle, saying this is part of a larger shift by President Nicolas Maduro to transfer power to the military. Much of the authority has gone to Defense Minister Vladimir Padrino, who now leads a team that controls the country's food supply and seaports. "What this decree and this state of emergency are doing is giving more power to the armed forces," Erika Guevara Rosas, Americas director at Amnesty International, told CNNMoney's Maggie Lake Monday. Amnesty had previously denounced the decree as an "unlawful" act that "effectively amounts to forced labor." In the vaguely-worded decree buried in a 48-page document from July 22, the government states that citizens could be forced to work in the fields for 60 days, and perhaps longer "if circumstances merit." "A special transitory regimen of obligatory and strategic character is established for all the public and private companies of the country -- of public and mixed ownership -- [with the purpose of] contributing to the productive reboot of the agricultural sector," according to the decree. The decree states that workers can't lose their jobs or be demoted while they work in the fields. The government will also pay their salary. Earlier in July, Maduro tapped Padrino to control the country's food supply and distribution. It's a huge position considering that Venezuelans can't buy basic goods like bread, eggs and milk. Maduro's government is refusing any help from Amnesty and other international aid organizations. He's blocked the entry of free medicine while hospitals are severely under supplied. "For them, accepting the humanitarian assistance is in some way recognizing that the crisis is being created by the government," Rosas argued. The crisis stems from years of government overspending on social welfare programs central to the socialist regime's agenda. At the same time, Venezuela has seen its sole source of income -- oil -- lose more than half its value in the past two years. Venezuela has the world's largest proven oil reserves. Venezuela's economy is expected to shrink 10% this year and inflation could rise to 700%, according to the IMF. Against this backdrop, Maduro, who is battling an opposition-led Congress, is either transferring power to the military or trying to build support with it, experts say. "The country is essentially run ... by military force," Luis Almagro, secretary general of the Organization of American States, told CNNMoney Monday. "So far, the government has expressed that there is no humanitarian crisis even though they've taken measures that reinforce the idea of the humanitarian crisis."